… or “We’ll decide who comes into this country” – John Howard. So we’ve had a record deal with the Chinese on the one hand for natural gas into the future, and a rather heavy diplomatic cooling on the other. What’s new? The Opposition did their best to behave like an Opposition on issues they fundamentally agree with the government on. Clarke and Dawe captured that beautifully on The 7.30 Report last night. KERRY O’BRIEN, PRESENTER: Time now for John Clarke, Bryan Dawe and Joe Hockey, giving credit where it’s due. BRYAN DAWE: Joe Hockey, thanks for your time. JOHN CLARKE: It’s very good to be with you Bryan and good evening. BRYAN DAWE: You’re pleased at the announcement of this big new gas deal off the West Australian Coast, weren’t you? JOHN CLARKE: Yeah I’m delighted, Bryan I’m always very keen on anything that goes to the benefit of Australia and Australians, I don’t apologise for that Bryan, neither do I resile from it. I don’t apologise for that at all. BRYAN DAWE: This is the biggest business deal in Australian history? JOHN CLARKE: It is, it’s great for the West Bryan, It’s great for business and it’s great for Australia. 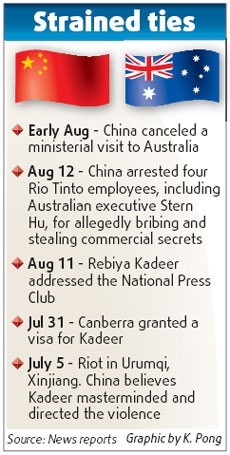 China canceled plans for Vice-Foreign Minister He Yafei to visit Australia earlier this month, reportedly due to Canberra granting a visa to Rebiya Kadeer, the mastermind of the July 5 Urumqi riot. The decision was the latest sign that ties between the two countries are strained. "Australia very much regrets that China decided to take that response," Australian Foreign Minister Stephen Smith told Parliament yesterday. China’s Foreign Ministry yesterday refused to comment. Opposition leader Malcolm Turnbull accused Prime Minister Kevin Rudd, a Mandarin-speaking former diplomat to Beijing, of bringing bilateral relations to "the lowest ebb that they have been for many, many years". "He obviously has no leverage with China left at all," Turnbull said. On Rebiya Kadeer see Amnesty International. Since the late 1980s, Chinese government policies and other factors have generated growing ethnic discontent in the Xinjiang Uighur Autonomous Region. In the past few years, thousands of people there have been the victims of gross human rights violations, including arbitrary detention, unfair political trials, torture, and summary executions. These violations, suffered primarily by members of the Uighur ethnic group, occur amidst growing ethnic unrest fueled by unemployment, discrimination and restrictions on religious and cultural freedoms. The situation has led some people living in the XUAR to favor independence from China. Crackdowns in the region intensified after September 11, 2001, with authorities designating supporters of independence as “separatists” and “terrorists.” Uighurs, most of whom are Muslim, have been the main targets in the region of the Chinese authorities. Authorities have closed down mosques, detained Islamic clergy, and severely curtailed freedom of expression and association. The Master said: “Even with a true king, it would certainly take one generation for humanity to prevail.” — Analects 13. Sure, last night was about power; it was meant to be awesome. But it is also good to have been shaken a little from our sometimes Eurocentric idea of civilisation. Yes, I am aware of human rights issues in China. I have after all met people who actually were in Tiananmen Square in 1989. I have met people who went through the Cultural Revolution. M’s own brother was in a re-education camp for two years post 1989… But I have spoken of such matters so many times already. See Nagging questions amid ruins of Tiananmen by Nicholas Jose, a review of Beijing Coma by Ma Jian (Chatto & Windus). Nick was in China at the time and close to the action. He is also a long-term friend of M — longer than I have been. ONE of the easiest ways to get into trouble in China is to go public about Tiananmen Square. The massive protests and bloody crackdown there in 1989 are still taboo subjects. The poet Shi Tao, for example, is in jail for revealing in an email the government’s plans for handling the anniversary of the event in 2004. By putting Tiananmen Square at the heart of his ambitious new novel, Beijing Coma, Ma Jian takes on what is unspoken and unspeakable in China: the physical and psychological violence done to people in the name of the state. China has changed almost beyond recognition since the 1980s. A new generation has grown up with little knowledge of the past. Even those who can remember are happy to look forward in the belief things keep getting better. But unfinished business remains, surfacing every time the giant square appears on television, filled with smiling faces, to remind authorities they cannot afford to loosen their grip. During the Olympics, reporting from Tiananmen Square will be the most closely watched of foreign media activity. It is probably asking too much of a novel to provide a coherent analysis of Tiananmen Square at the same time as fictionalising a raw and unresolved moment in history. Ma’s protagonist remains disturbingly ambivalent about the questions at the heart of the novel, coming across as a picaresque traveller through the wreckage of 1989. Could it have been different? Did the students act in vain? Is there another, hidden story? Is change for justice possible, in China or anywhere? Answers slip away as the novel’s remonstration grinds on. The sardonic hero, imprisoned in a needy ego and a body that refuses to die, is left with only the fading loops of memory. Geremie Barme offers a fascinating cultural reading of the Opening Ceremony in today’s Sydney Morning Herald: Olympics come to life as a painting by Beijing and athletes. Most observers noted that Mao Zedong, the party chairman who founded the People’s Republic in 1949 and led the country until his death in 1976 (launching the disastrous Great Leap Forward in the late-’50s and the decade of disruption of the Cultural Revolution from 1966) was entirely absent from this paean to China’s past civilisation. In reality, the Great Helmsman does get a look-in, if only obliquely. But after the spectacular highlights of traditional China, powerful images jostle, appear momentarily and are crowded out as one mass scene after another presses in, or some vignette comes and goes in fleeting glitz. The Chinese voice-over speaks repeatedly about traditional aesthetics and the language of understatement and elegance, but as the show goes on, a certain failure of artistic coherence becomes increasingly obvious. People will debate the contents and significance of the visual banquet for some time. What does remain, however, is a Chinese painting which the whole world, through its athletes, has helped co-create. … Every day, we carry on about how the Chinese nation is going through its most dangerous period. Yet, in fact, the Chinese people lack a sense of urgency about the crises and dangers we face. Our overweening sense of self-importance, conservatism and complacency, blind optimism, propensity for idle boasting, flattery, unscrupulous behaviour, self-deceit, and trickery have the most serious consequences for the nation and our people. In the Hills of China was banned, along with many other works, as part of the clampdown on dissent that followed the 1989 protests and massacre. The People’s Daily and other state organs published attacks on authors like He Baochuan, accusing them of wanting to sell out China to the West. The shrill language of these attacks bore echoes of Red Guard rhetoric, and was a foretaste of the style of vilification which netizens and other self-appointed guardians of China’s national honour today direct at anyone, Chinese or foreign, deemed to have insulted China’s national pride, often because they have dared to address its problems. A few months ago, when the violence in Tibet prompted worldwide protests and counter-protests, a mainland student, Grace Wang, tried to encourage dialogue between pro-Tibetan and pro-Chinese protesters at her university in the US. Web vigilantes went after her with viciousness; after her parents’ details were found and published, self-styled patriots smashed the windows of their home in Qingdao and dumped faeces on their doorstep. Wang wrote in the Washington Post that her mother and father had been compelled to flee. The threats on her own life forced her to accept police protection. But she also insisted that there were people on the pro-Chinese side who had been willing to talk with the pro-Tibetans before the more strident voices drowned them out. Click the nice green pic to see what else The Monthly has to offer. I thought I would help friends in China out by drawing attention to Amnesty International, particularly to the recent report on the eve of the Beijing Olympics — which I do hope go as well as can be expected. I further am helping out by tagging certain entries on this blog China forbidden topic. Now that will save the censors over there quite a lot of trouble, won’t it? So kind of me. Finally, over the fold you will find your very own copy of the Amnesty Report. Can’t be more generous than that, can I? The day that there are no Five Forbidden Topics will be the day China will have really stood up! 1949 was an interesting start and much good and bad has happened since. I like China and Chinese people, I really do; I mean that. But there is a goal to aim for… No more Forbidden Topics! Just in from Radio Australia: China blocks internet access for foreign media. Bright of them, isn’t it? Despite everything I am determined, if I can, to enjoy these Olympic Games as I usually do… And I am sure they will be spectacular, and I perfectly understand the ordinary Shanghainese or Beijinger being really proud and upbeat. However, that Chinese Government. Oh dear yes… The wind can be fickle in Beijing. This is the documentary shown last night on Four Corners on ABC: Undercover in Tibet. As Tibetan protesters take to the streets in the biggest and most bloody challenge to Chinese rule in nearly 20 years, Dispatches reports on the hidden reality of life under Chinese occupation after spending three months undercover, deep inside the region. Dozens are feared dead after the recent clashes and crackdown by Chinese troops, but with reporting so rigidly controlled from the region little is known of living conditions inside Tibet. To make this film, Tibetan exile Tash Despa returns to the homeland he risked his life to escape 11 years ago, to carry out secret filming with award-winning, Bafta-nominated director Jezza Neumann (Dispatches Special: China’s Stolen Children). Risking imprisonment and deportation, he uncovers evidence of the “cultural genocide” described by the Dalai Lama. He finds the nomadic way of life being forcefully wiped out as native Tibetans are stripped of their land and livestock and are being resettled in concrete camps. Tibet reveals the regime of terror which dominates daily life and makes freedom of expression impossible. Tash meets victims of arbitrary arrests, detention, torture and “disappearances” and uncovers evidence of enforced sterilisations on ethnic Tibetan women. He sees for himself the impact of the enormous military and police presence in the region, and the hunger and hardship being endured by many Tibetans, and hears warnings of the uprising taking place across the provinces now. There is no doubt about it. What the Chinese government is engaged in is colonisation, and a systematic and ruthless colonisation at that. What else in all honesty could it be called? Watch this for yourself and make your own judgement. Most others will have forgotten, such is the short-term memory loss in our world of blogs and instant media and information overload, but less than a year ago we had a Prime Minister named John Howard, a Foreign Minister named Alexander Downer, a visit from George W Bush, an Immigration Minister named Kevin Andrews, and our very own international Islamist Terrorist investigation into one Doctor Haneef. My memory is online and uncensored of course: here. LESS than a year after he was locked up in Brisbane as a suspected terrorist, Mohamed Haneef has shared a podium with the Dalai Lama at an anti-terrorism conference in India. The Indian doctor, who was arrested and then cleared of terrorism charges last July, told young Muslims across the world to beware, because they have been typecast as terrorists. “I am a living example of how the menace of terrorism has affected innocent lives and the phenomenon of how Muslims are stereotyped as being terrorists or sympathisers of terrorists whether they are guilty or not,” he said. Dr Haneef was a guest at a conference in New Delhi on Sunday organised by the Jama Masjid United Forum, an Islamic organisation in India that aims to “eradicate the root cause” of terrorism. It was also addressed by Islamic leaders and Indian ministers and MPs. The Dalai Lama used his speech to strongly condemn terrorism, but called for “unbiased initiatives” to combat it. He said it was wrong to malign any one religion because of terrorist acts. The Tibetan spiritual leader also said India’s tradition of religious tolerance was a role model for the world. However, that tolerance has been tested by a devastating terrorist bomb attack in Jaipur, the capital of Rajasthan state, three weeks ago. The series of blasts, which killed 60 people and injured about 200, have been blamed on Muslim extremists. After the attack an influential conservative Muslim seminary in India, the Darool Uloom Deoband and its political arm, Jamiat-i-Hind, issued a “fatwa” against terrorism. The 150-year-old institution, which influences thousands of smaller Islamic schools across the subcontinent, issued the fatwa at a meeting attended by thousands of clerics and students in Delhi.